Motivated by the ever-advancing digital age, Drs. Edward Romano and Matthew Vaccaro of Aesthetic Smiles of New Jersey set out to produce a comprehensive, yet convenient dental resource for patients interested in smile enhancements. By teaming with Rosemont Media, they developed a customized dental website design that successfully achieved their goal while effectively capturing the patient-first approach conveyed throughout their practice. Featuring picture-coded drop-down tabs and an aesthetically-pleasing layout, the new site is designed for current and prospective patients to easily navigate and research a broad variety of dental techniques spanning from cosmetic dentistry to sedation dentistry. Additionally, the website is equipped with social media buttons, links to related pages, patient testimonials, a dental blog, and several other key features that can help to enhance pre-treatment education and encourage doctor-patient communication. 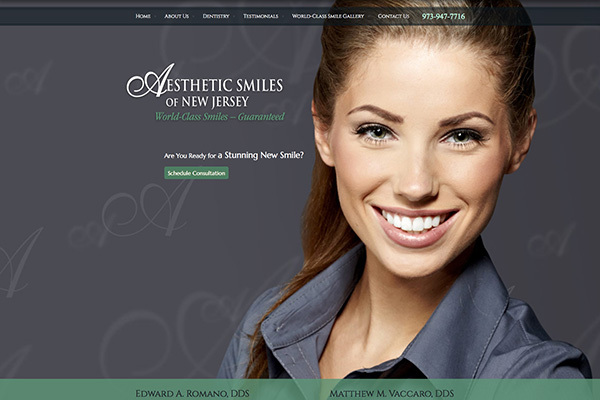 By implementing the latest dental SEO and SMO strategies, our experienced marketing team also optimized the Aesthetic Smiles of New Jersey website to rank competitively on leading search engines for popular terms including porcelain veneers, Invisalign®, and more. Through their highly-collaborative effort with Rosemont Media, Drs. Romano and Vaccaro were able to develop a customized website that mirrors the quality and excellence of care they provide their patients day in and day out. To take a look at the style of custom website our team of designers, developers, and writers can create for your dental practice, visit nationalveneerdentist.com.